Intuitive and Feeling types – they are cooperative, empathic and imaginative, focusing on empathy, morality and cooperation. Forming around 7% of the population, people with the ENFP personality type tend to be curious, idealistic, and often mystical. They seek meaning and are very interested in other people’s motives, seeing life as a big, complex puzzle where everything is connected. Not surprisingly, ENFPs tend to be very insightful and empathic individuals. 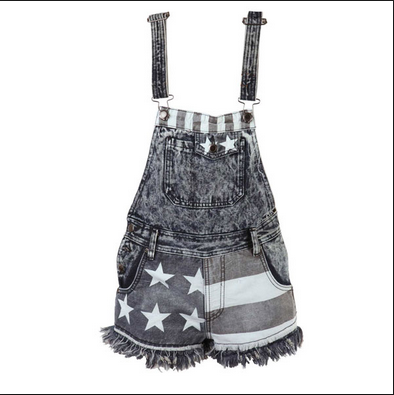 This, plus their charm and social skills, often makes them very popular and influential. On the other hand, this can also be a disadvantage as the ENFP is likely to worry about not being sufficiently original or spontaneous. If they are not careful, this personality trait can lower their self-esteem. ENFP personalities are usually characterized by high levels of enthusiasm, especially when it comes to things that spark their imagination. In such cases, ENFPs can be very energetic and convincing; they are able to easily persuade other people to join their cause. Ironically, this trait can also turn against the ENFP , when they suddenly find themselves center stage, being seen as leaders and inspiring gurus by other people. ENFPs strive to be independent, so they do not always welcome such attention. 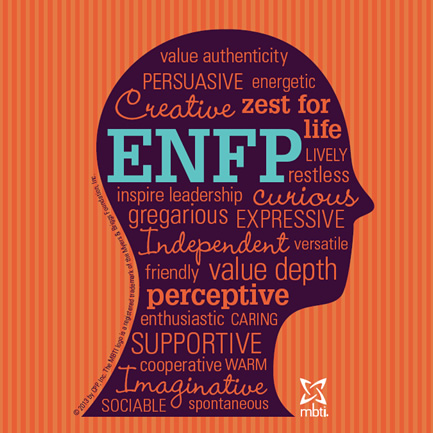 ENFP personalities are very emotional and sensitive, believing feelings are something everyone should take time to understand and express. However, this trait can also cause a lot of stress for them as ENFPs may often focus too much on other people’s motives and the possible meanings behind their actions. People with this personality type are sharp-eyed and intuitive, but they can make serious mistakes when they try to use their interpretation of other people’s emotions as a basis for their decisions. ENFPs are also likely to have difficulties dealing with routine, administrative matters. They are more interested in freedom and inspiration than security and stability, and this attitude is usually clearly visible: an ENFP would rather try to come up with an interesting solution or an idea, no matter how difficult that is, than deal with simple yet boring tasks. People with the ENFP personality type know how to relax, drawing on their imagination, enthusiasm, and people skills. For instance, they can be very serious and passionate about work during the day and then later let off steam at a wild party in a nightclub. This switch between the two modes can often be instantaneous, surprising even their closest friends. Finally, ENFPs are non-conformists, following their own path and trusting their intuition. Their talents are numerous, but they all depend on the ENFP being given enough freedom. People with this personality type can quickly become impatient and dejected if they get stuck in a boring role where they are unable to freely express themselves. But when the ENFP finally finds their place in the world, their imagination, empathy, and courage are likely to produce incredible results. There are so many potential ENFP careers that it is difficult to list everything in one short article. However, we hope that the details that follow will help some ENFPs in their search for the ideal job. This is one of the most universal personality types, jack-of-all-trades and master-of-many . As long as the ENFP does not get into a career path that is definitely unsuitable for them, they are likely to do well in any role. To begin with, ENFPs have excellent social skills and are astonishingly perceptive. This personality type is unsurpassed when it comes to networking and finding out what makes people tick, which is a great skill in any career. Furthermore, ENFPs have a unique ability to communicate with others on their own level, which allows them to create strong and lasting relationships. Due to these traits, typical ENFP careers involve a lot of personal interaction and require good people skills. For instance, ENFPs can be excellent psychologists, teachers, counselors, diplomats, or politicians . Next, ENFPs tend to be very talented, energetic, and future-oriented. They can easily compete with Analysts (NT) in the career field when it comes to seeing the bigger picture or finding the underlying principle. Furthermore, despite being a Feeling (F) type, ENFPs excel at using their logic, forming a very potent combination of intuition and rationality. They can focus on the main goal and then put together the plan to achieve that goal. There are many potential careers that make good use of these ENFP traits: people with this personality type tend to be brilliant system analysts, scientists, engineers, and entrepreneurs . This is where ENFPs can truly shine. For instance, scientists and engineers with great networking and people skills are extraordinarily rare. The same can be said about other ENFP careers, but this is an excellent example of how effective ENFPs can be in certain jobs. Finally, people with this personality type have excellent communication skills, both written and verbal. ENFPs can also be truly inspiring leaders in many careers, but they do not try to control or enjoy controlling other people. However, there are several weak spots in their armor. First, ENFPs need to feel appreciated by their colleagues and superiors; lacking this can threaten their emotional stability in certain cases or careers. Second, ENFPs get bored quite quickly and consequently tend to jump from project to project looking for some new and exciting ideas. Third, ENFPs dislike dealing with monotonous tasks and are likely to do everything they can to avoid them. 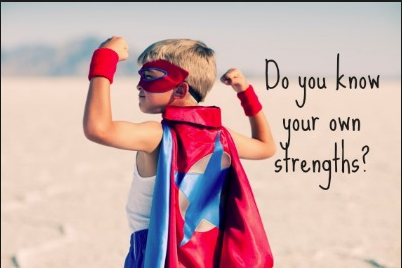 These traits may hinder their progress in certain careers; however, some ENFPs turn them into strengths. For instance, ENFPs do very well in careers such as writing, journalism, acting, or TV reporting ; such jobs can ensure that the ENFP never runs out of interesting ideas, and they have a big audience to keep them going for a long time. If you are working for a large company, you probably already know an ENFP colleague, manager, or subordinate. People with the ENFP personality type seem to be everywhere, even though they make up only around 5 percent of the population. Furthermore, they can easily get along with nearly all other personality types, which makes them ideal coworkers. So what are ENFPs like in the workplace? *Observant. ENFP personalities believe that there are no irrelevant details or actions. They try to notice everything, seeing all events as part of a big, mysterious puzzle called life. *Very popular and friendly. 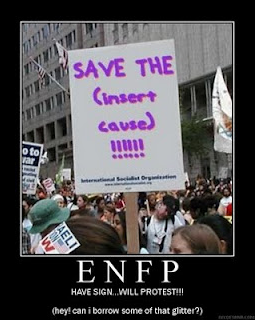 ENFP are altruistic and cooperative, doing their best to be empathic and friendly in every situation. They can get along with nearly everyone and usually have a large circle of friends and acquaintances. *Energetic and enthusiastic. ENFP are always eager to share their ideas with other people and get their opinions in return. Their enthusiasm is contagious and very inspiring at the same time. *Know how to relax. People with this personality type know how to switch off and have fun, simply experiencing life and everything it has to offer. Their wild bursts of enthusiastic energy can often surprise even their closest friends. *Excellent communicators. ENFPs tend to have great people skills, and they instantly know how to present their ideas in a convincing way. They can handle both small talk and deep, meaningful conversations, although the ENFP’s definition of small talk may be somewhat unusual—they will steer the conversation toward ideas rather than weather, gossip, etc. *Curious. ENFPs are very imaginative and open-minded. 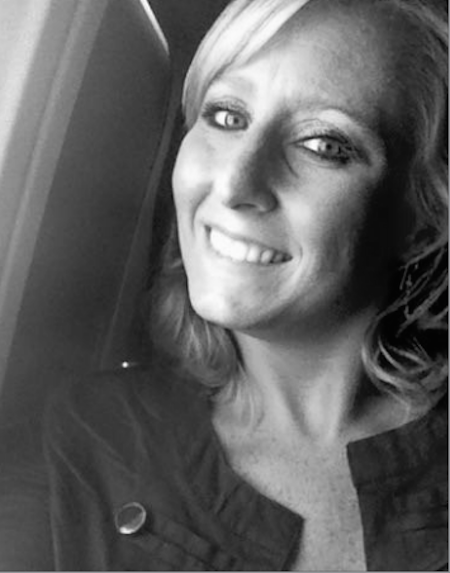 They enjoy trying out new things and do not hesitate to go outside their comfort zone if necessary. *Highly emotional. 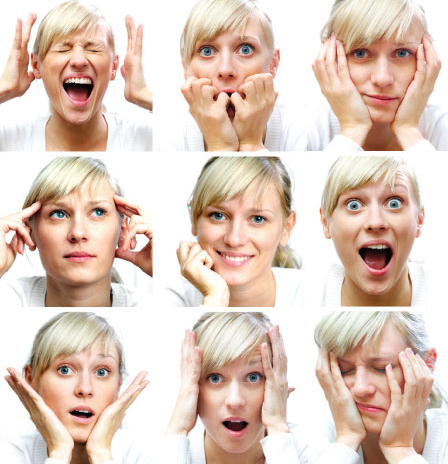 ENFP personalities tend to have very intense emotions, seeing them as an inseparable part of their identity. This may often cause the ENFP to react strongly to criticism, conflicts, or tension. *May have poor practical skills. ENFPs are brilliant when it comes to solving problems, creating processes, or initiating projects (especially if they involve other people). However, they are likely to find it difficult to follow through and deal with the practical, administrative side of things. *Overthink things. ENFPs always look for hidden motives and tend to overthink even the simplest things, constantly asking themselves why someone did what they did and what that might mean. *Find it difficult to focus. 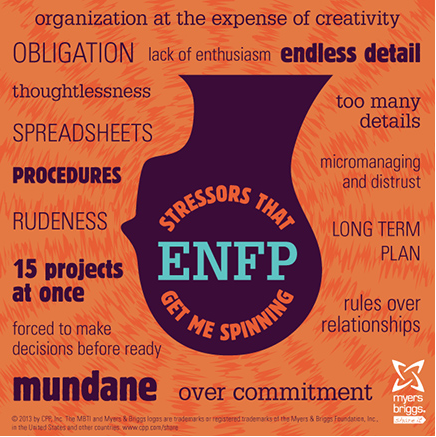 People with the ENFP personality type lose interest quickly if their project shifts toward routine, administrative matters. They may not be able to stop their mind from wandering off. *Very independent. 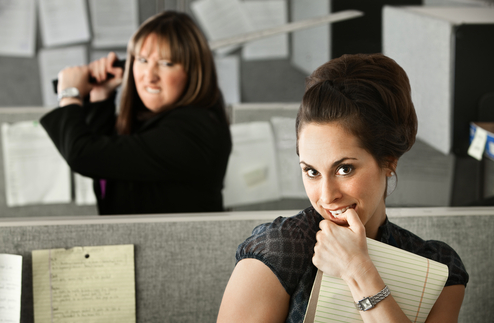 ENFPs loathe being micromanaged or restrained by rules and guidelines. They want to be seen as highly independent individuals, masters of their own fates. ENFP personalities are likely to be cheerful, sincere, and open-minded friends. They rarely have any difficulties understanding other personality types and interacting with them in their “language.” This is a very rare and valuable trait. Even though some of the ENFP’s friends may be unable to reciprocate, they will certainly recognize and appreciate the ENFP’s efforts. People with this personality type are usually able to draw even the most reserved friend out of their shell. Because ENFPs are so intuitive, they rarely have any difficulties finding out what drives and inspires their friends. ENFPs’ ’ enthusiasm and warmth can be very infectious as they stem from the pure idealism this personality type is known for. However, ENFPs should make sure that their attention does not get tiring—not every friend can cope with the never-ending stream of ideas and topics that an ENFP’s mind can generate. ENFP friends tend to be very caring and supportive, but they also need to make sure that their own needs are being met. People with this personality type may sometimes get too deeply involved in the lives of their friends, forgetting to pay enough attention to themselves. Furthermore, ENFPs also tend to harbor unrealistic expectations when it comes to friendships. This can potentially lead to stress and disappointment once the ENFP realizes that their friends are not as flawless or dedicated as they would like them to be. Generally, ENFP friends are likely to be quite idealistic and sensitive. This sensitivity enables them to connect with their friends and acquaintances very easily, but it also makes the ENFP very vulnerable to criticism. This is why ENFPs tend to avoid people with strongly expressed Thinking (T) or Judging (J) traits. Those personality types are likely to have strong opinions about a variety of topics, and the ENFP is likely to feel quite uncomfortable arguing with them. That being said, ENFPs are fascinated by mysteries and will do their best to understand the other person if they sense that there is some substance beneath the surface. This is one of the reasons why ENFPs tend to form extremely strong friendships with Diplomat (NF) and Analyst (NT) types.